Amin Al Arrayed, General Manager of First Bahrain and Managing Director of Majaal Warehouse Co. was interviewed for an article published in the Arabian Homes Magazine on Dec 1st 2012. 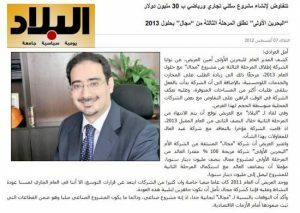 Amin Al Arrayed, General Manager of First Bahrain was interviewed for an article published in the Al-Watan Newspaper on Nov 12, 2012. Amin Al Arrayed, General Manager of First Bahrain and Managing Director of Majaal Warehouse Co. was interviewed for an article published in the Arabian Homes Magazine – Nov 1st 2012. 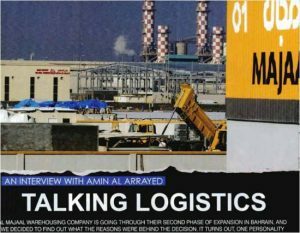 Amin Al Arrayed, General Manager of First Bahrain and Managing Director of Majaal Warehouse Co. was interviewed for an article published in the Gulf Daily News on 24 August 2012. 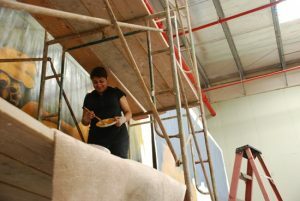 Award winning local artist Mariam Haji is set to open her first solo exhibition, “Premonition”. The show will open on 21 October 2012 at the Bin Matar House, the art exhibition venue of the Shaikh Ebrahim bin Mohammed Al Khalifa Center for Culture and Research. Majaal Warehouse Company, which develops industrial facilities for small and medium enterprises (SMEs), has signed a key sponsorship agreement with Hilal Conferences and Exhibitions (HCE) to take part in the Gulf Industry Fair 2013 next January. Majaal, which last participated in the business-to-business dedicated industrial show in 2011, will be the principal strategic sponsor of the industrial facilities show segment, as per the agreement. Amin Al Arrayed, General Manager of First Bahrain and Managing Director of Majaal Warehouse Co. was interviewed for a feature article in the Gulf Daily News by Jennifer Ghanna. Amin Al Arrayed, General Manager of First Bahrain and Managing Director of Majaal Warehouse Co. was interviewed for an article published in the Al Bilad newspaper on 07 August 2012 on the topic of local expansion in the Kingdom of Bahrain. 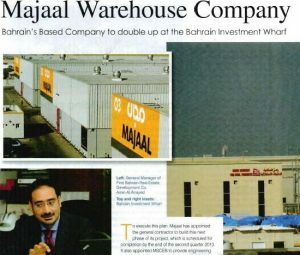 Majaal Warehouse Co., the leading provider of warehousing and industrial facilities for Small to Medium-sized Enterprises (SME’s), announced today that it will double the size of its facilities at the Bahrain Investment Wharf (BIW). To execute this plan, Majaal has appointed Abdulaal Construction Services as the general contractor to build this next phase of its project, which is scheduled for completion by the end of the second quarter 2013. The announcement follows the achievement of full occupancy for the first phase of the project late last year along with evidence of renewed stability and business confidence in the economy of Kingdom of Bahrain. 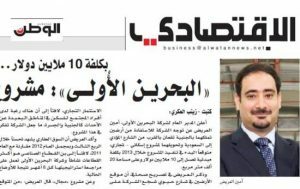 Amin Al Arrayed, General Manager of First Bahrain and Managing Director of Majaal Warehouse Co. was interviewed for an article published in the Al Ayam newspaper on 18 May 2012 on the topic of regional expansion.